Because Fitaly is specifically designed for stylus typing… to minimize hand movement. The center has 73% of the keys used in normal writing. Adding ch um gives 84%, all reached by just moving the fingers holding the stylus. And each key is near the keys likely to follow. Accuracy and speed! By design! Yes, I want it - $35. Demo, to see for myself. In the beginning, the Palm was designed to replace your calendar. It had very little memory and not many programs. Text entry was not a problem because there was not much to enter. all these applications always with you, instantly available with a computer you can carry in your pocket. A new idea. FitalyStamp is an overlay over the Palm's Graffiti area with the first keyboard layout specifically designed for entering text into a Palm with a stylus. 73% of the letters you use in normal text are in a very tight central area. Fast text entry. Error-free. In an hour or two of practice, users typically exceed their Graffiti speed, even more so when you factor in the time to correct Graffiti errors. 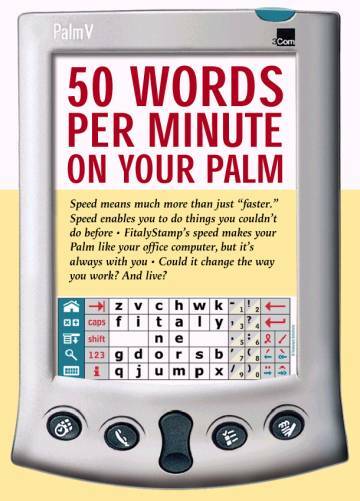 50 words per minute on the palm is in your near future! One contestant in the Dom Perignon speed contest reached 80 wpm,  see the  and average contestants were over 50 wpm, far better than Graffiti or Qwerty users! Graffiti? Hard to learn. Rigid requirements. Noone ever learns or remembers the nuances. But even after you master Graffiti, what have you accomplished? At best you write slower than you can with a pad and paper. Take along Keyboards? If you set up the keyboard, connect the Palm, and find and sit at a table, they will do some of the job. Of course, if you do that, you could use a much more powerful computer. Try a laptop. The very qualities that make the Palm so useful are almost totally negated by having to set up a keyboard on a desk. Typing with a stylus on a Qwerty keyboard, however, is not a good idea. A layout designed in 1867 to keep a type writer from jamming is not appropriate for stylus tapping; it is using a screwdriver to drive home a nail. Possible, but too slow, too error-prone, too tiring, too inefficient. Copyright © 2001 Textware Solutions.